I meet tons of people through my open houses – and it can be a lot of fun. 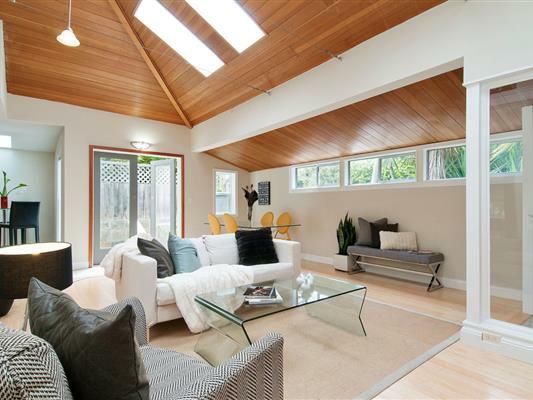 Just as with everything else, though, open houses can be a mixed bag. Take this as a guide to how to act – and how not to act – when you walk into an open house. It’s actually okay if you’re not a real buyer – I welcome your visit. I’m sociable and friendly and you’ll find me fun to talk to if there are no other visitors I need to show the house to. That said, it works better if you tell me up front that you’re more of a browser than a buyer. It’s not comfortable for anyone if you’re trying to hide that fact – sometimes people will make up an obvious story about looking on behalf of a friend or relative. I get the same thing from older couples who I suspect are tourists or day-trippers – they like to tell me they’re looking on behalf of their kid. Keep it honest, please. The dynamics of packs can be a problem. These are groups of three, generally all the same gender, usually less than 35 years old. You can tell they’re cruising open houses for entertainment – they seem out of their element and ill at ease. They tend to talk only to each other and ignore me. Sometimes they’re really young – teenagers. That’s when I have to track them a bit, worrying about sticky fingers. You’d be surprised at what open-house visitors tend to steal – bars of soap! Then there are people who are just plain difficult – or worse. 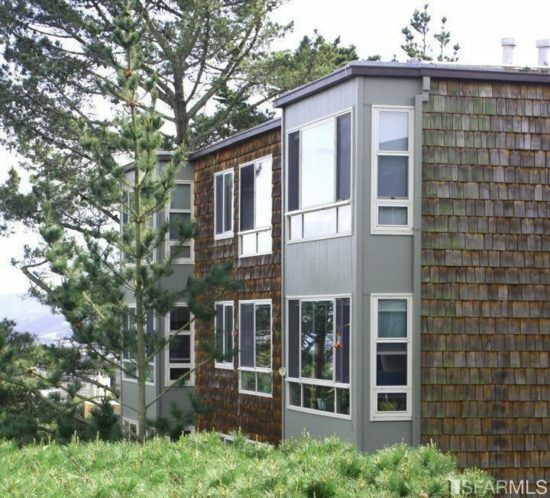 I once had to threaten to call the police on a neighbor when I had a listing in outer Noe Valley – not only was she drunk, she wanted to tell me how disgusting she thought the former owner of my listing was because he died of AIDS. Then there was another neighbor – with the same listing – who was so terribly lonely she would come over and stay forever. I could never figure out how to gently get rid of her. Perhaps the most important thing you can do etiquette-wise is keeping your opinions to yourself. You never know who might be in the house. Once, while I was holding my own home open at the time I was selling it, a buyer came through and told me she hated the color of the walls. I had spent hours choosing and obsessing over that color. I also recently had a contractor do a heavy critique on one of my listings, declaring that the owner must be really cheap since she clearly didn’t care about certain elements. What he didn’t know was that the owner is one of my best friends. If you love the house and want to buy it, it pays to be nice to the listing agent. Remember that we evaluate the buyers who come through and report back to our sellers. If you seem overly fussy, difficult and overly cautious, I take that into account if you do wind up bidding on the property. Stay tuned for another post about mistakes in home prep. Your home has to show well if it’s going to sell. 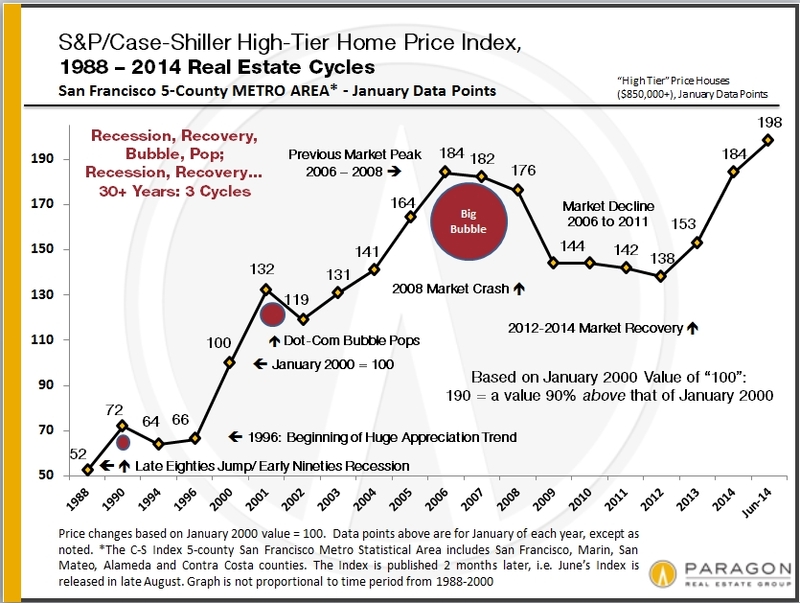 The new Case-Shiller numbers are out for June, and can you guess what they reveal? Take a wild guess … okay, I’ll tell you. We’ve got some accelerating prices on properties, folks, and if you haven’t figured that one out, you probably should have. 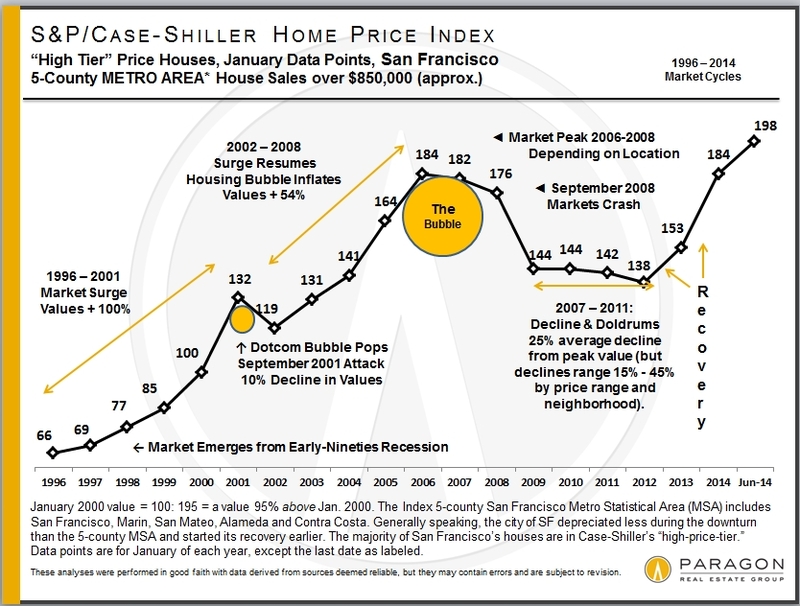 First, a little primer on Case-Shiller: it covers the house markets of five Bay Area counties, divided into three price tiers, each constituting one third of unit sales. 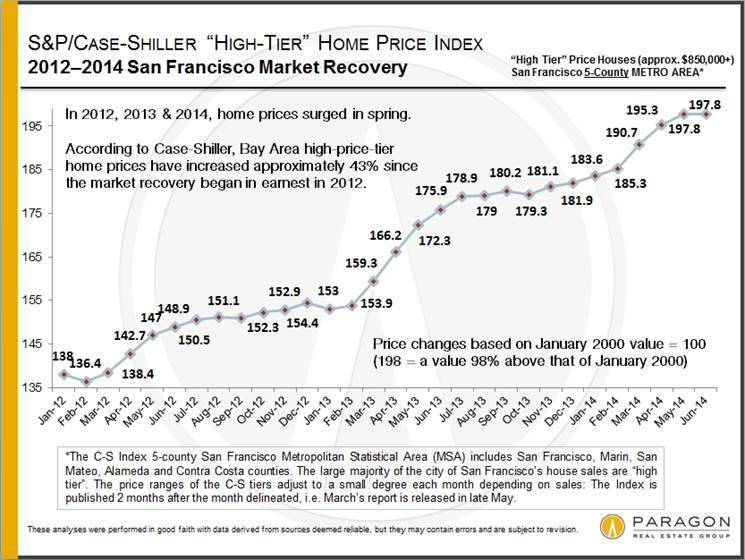 Most of San Francisco’s (as well as Marin and San Mateo’s) house sales are in the high-price tier, so this is where we focus most of our attention. The index is published two months after the month in question and reflects a three-month rolling average, so it will always reflect the market of some months ago. What I’m saying is this: take it with a grain of salt. Typically, the market cools off and plateaus for the summer months – that’s what we’ve seen in the new Case-Shiller numbers for June. However, if you look at the chart accompanying this article, you’ll see that accelerating prices have been the norm ever since the recovery began in earnest in 2012. So what does the future seem to hold? We’re going to see another big indication of market conditions and trends in terms of the autumn selling season, which starts mid-next month That’s typically when there is a large surge in new listings and buyer demand picks up again until the holiday slowdown begins in mid-November. 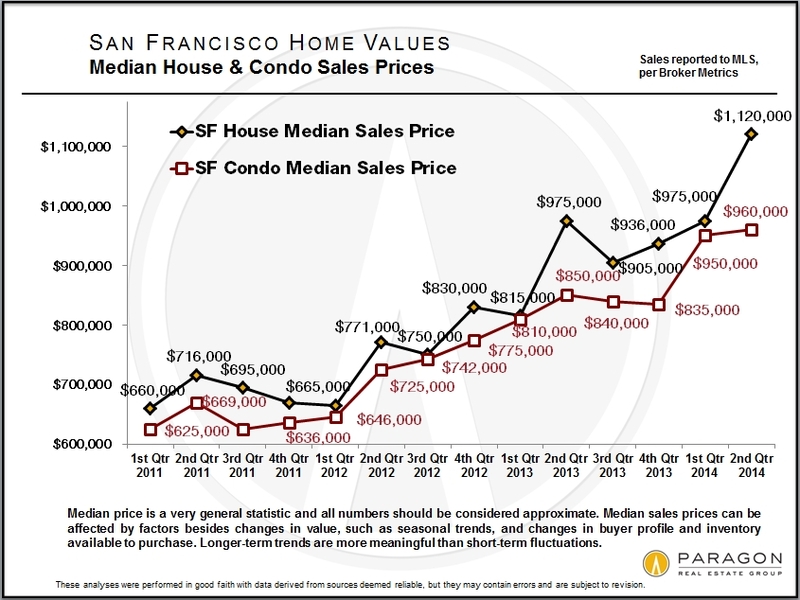 In terms of the high-price home segment for the San Francisco metro area, there was no real significant change from May to June, although the low- and mid-priced segments both ticked up by a percentage point or two. However, it’s worth remembering that short-term fluctuations are much less meaningful than longer-term trends. Specific questions? Give me a call. Last early Sunday morning, many of us in the Bay Area were rudely awakened by a strong quake centered in Napa. This dramatic event was a serious wake-up call that reminded all of us of the possibility – no, the inevitability – of quakes in our neck of the woods, and the fact that we all need to prepare. We at Paragon have gotten our hands on a USGS Earthquake Safety pamphlet that deals with the steps of preparation to minimize the negative effects of an earthquake. Now is an opportune time as any to review these steps. First off, it’s crucial to get connected. As the pamphlet says: “Preparedness is all about people.” So what does this mean? It means turning to your community before disaster strikes can help strengthen your ties in the event of one – and help you get through it at least that little bit better. Options include connecting through digital networks such as Facebook, Twitter and Google Drive, meeting your neighbors on Nextdoor or signing up for AirBnB so you’ll have access to a place to stay should your home be damaged. Second, you need to gather supplies. A good rule of thumb, according to the pamphlet, is to have three days’ worth of supplies, including water, a first-aid kit and a flashlight and extra batteries. Other supplies include warm and sturdy clothes, a battery-operated or hand-crank radio and cash. The site also has a suite of videos for you to watch in order to get better prepared. They feature disaster survivors from Tokyo and New York City, as well as members of local community hubs. Finally, it’s time to make a plan. Select your group, pick an out-of-state contact and agree on a place to meet. This section includes a complete PDF to help you with accomplishing this task. No time like the present to start preparing. A little forethought goes a long way. 1) Use a colorful rug. 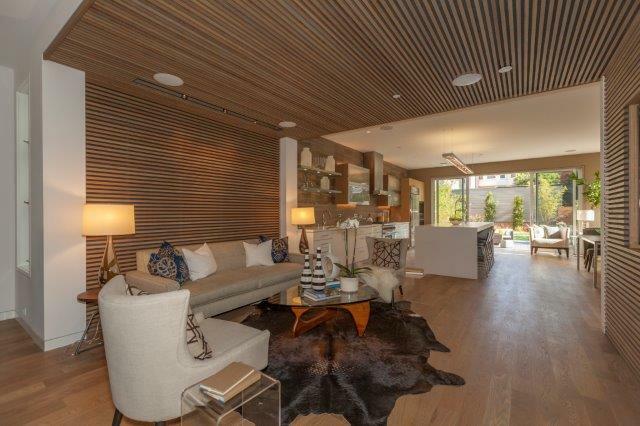 Inman says “instant style” comes with an eye-catching rug. Try horizontal stripes to make a narrow hallway feel wider, and a long rug extending from one end of the hallway to the other has dramatic impact as well. 2) Try a picture gallery. Extra-long hallways can benefit from a mix of family snapshots and art, which add warmth to the space. 3) Consider cabinetry. Wider hallways can handle custom cabinetry for extra display space and storage area. 4) Pick pendant lighting. Since most interior hallways lack windows, sufficient lighting is important. Hanging pendants can help light the way and add flair as well. 5) What about wainscoting? It’s a great decorative element – but it also helps keep your drywall free of markets, scrapes and bumps. Heavy-traffic areas benefit from wainscoting. 6) Benefit from bookcases. Inman notes that both a functional and aesthetic element can be added to hallways from bookcases, which help the avid reader who is flush in volumes. 7) Maybe a mural? Murals can be more affordable than wallpaper – and they come in many customizable options. 8) Framed mirrors can be the answer. Mirrors can help bring extra light and visual space into a hallway that is small, dark and in need of help. How does seasonality affect the San Francisco market? 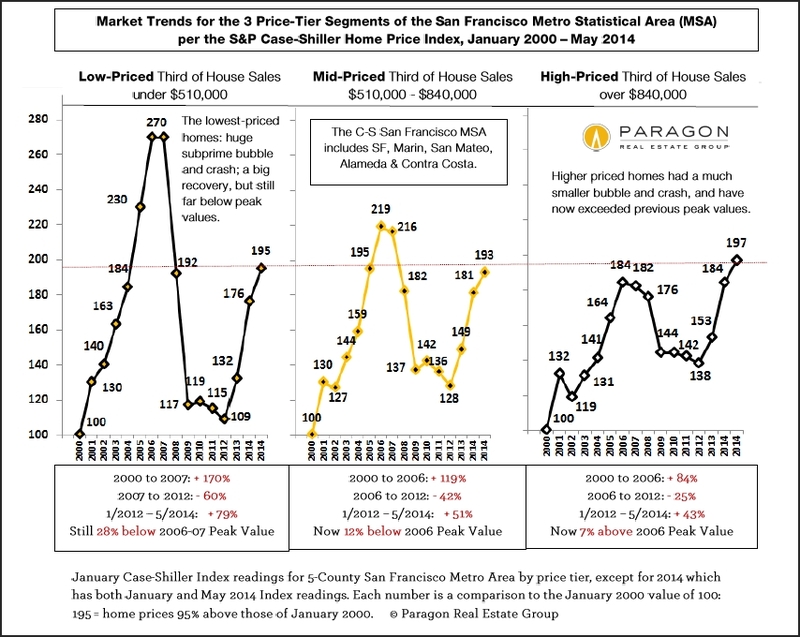 Paragon has just issued a new report: “Seasonality in the San Francisco Homes Market”, which discusses the effect of seasonal changes on our local real estate market. As noted in the report, seasonality typically affects inventory levels, buyer demand and median home prices, often in very significant ways. That said, it’s worth remembering that seasonality is not the only factor that affects market conditions and trends. Other factors include the economy in general, financial market movements, new construction projects coming online, significant interst-rate changes, local stock market IPOs, natural and political events and other various factors. 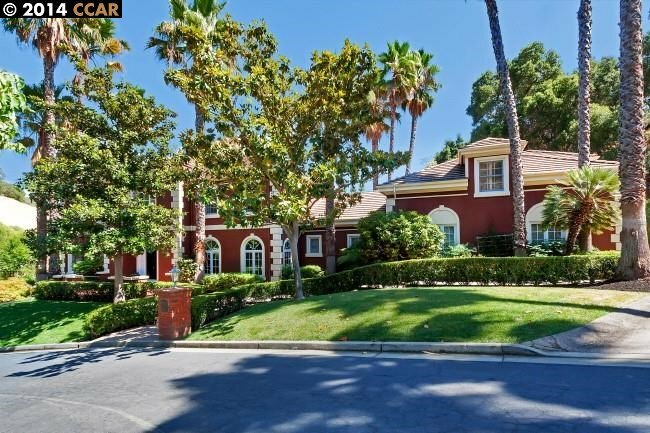 In addition, new listings and new sales are always being inked, and it is sometimes the smart strategy – depending on prevailing market conditions and a specific property – to buy or sell during slower periods. Typically, though, there are summer and winter slowdowns. The autumn market is the litmus test come mid-September with a typical surge of new listings; so is the spring market that begins in late February/early March. 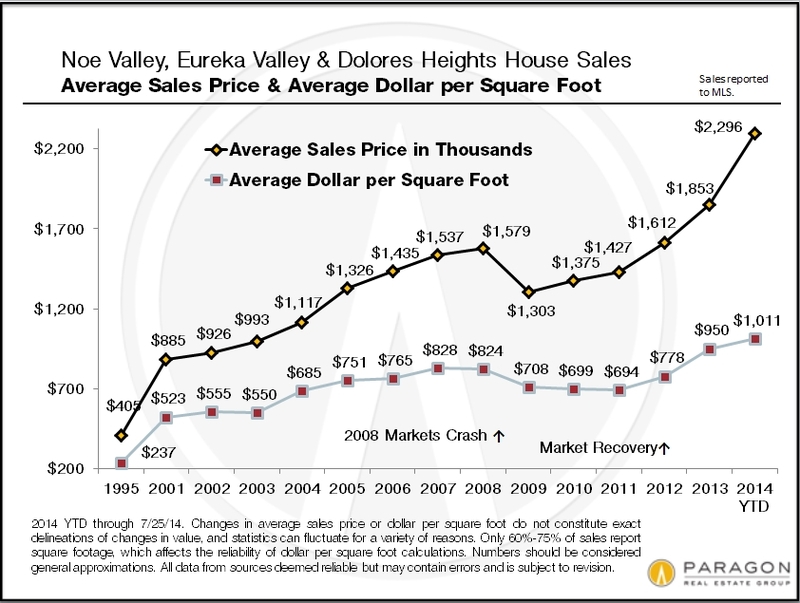 According to the typical ebb and flow in the higher-end market, which is usually more affected by seasonality than the general market, this means a higher median sales price during peak periods, and a lowered price during the slower ones. The market has been rapidly appreciating since 2012, notwithstanding the shorter-term ups and downs that seasonality can bring throughout the year. Keep in mind that in an appreciating or depreciating market, other factors typically impact median sales prices as well. It’s valuable to know that what is meaningful is the longer-term trend in housing prices, rather than the short-term fluctuations.